I don't normally play favorites, but today I'm going to... because I simply love this business. Since January, I've worked with Erin from The Vintage Pearl on numerous collaborations, and I've been blessed to wear some amazing pieces of her jewelry. My favorite piece of jewelry (besides my wedding ring, of course) is a good sterling silver right-hand ring, and I've found three from The Vintage Pearl that I swap in and out. I have this custom wrap ring (bottom left photo), this open heart ring (bottom right photo), and these personalized birthstone rings (top two photos)—and I just ordered a third one ("ours" with a December blue zircon) to complete my stack! 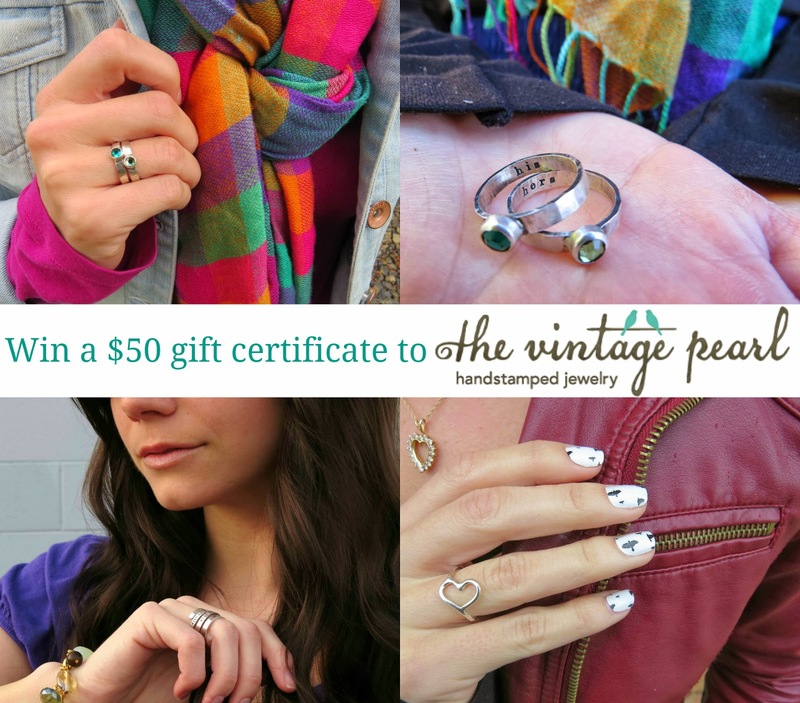 Today, The Vintage Pearl is giving away two $50 gift certificates so that you can pick a custom piece (or two!) of your choice! Simply leave a comment below—about anything—to enter! You can get extra entries for tweeting, pinning, and/or facebooking the giveaway, so just leave another comment with your link(s)—one comment per link—and you'll be entered. Update // Winners: #52 of 119 - Lindsay B, and #119 of 119 - Rachael F! The fine print: Giveaway open internationally. Giveaway ends at midnight on Sunday, October 13 and the winners (two) will be announced via email and in this post. This giveaway was sponsored by The Vintage Pearl. I love hand stamped anything.....what a great shop!! I am loving those rings! They are fabulous!! Ooh I love everything you've shown here. I will definitely be checking out the shop! I would absolutely love a piece of jewelry that celebrated our wedding day! Please please please pick me! And Pinned it :) Sorry to be obnoxious.. just would love to win this! Love, love , love the vintage pearl. I LOVE the initial rings!!! So cute! YAY!!! OOOH I love new jewelry for the fall! Such a fun and lovely giveaway! I saw you had the wrap ring on sometime last year and I had to order one for myself! I love it; wear it all the time! I love the Vintage Pearl!! My husband got me the love bird necklace for Valentine's Day a couple of years ago and I LOVE IT!!! Now that my son is here, I need to get a charm with his name on it. I absolutely love those rings! Tweeted it! I'm definitely getting the stackable birthstone rings, but a gift certificate would help me do that earlier! I love the gold skinny message ring! It's so delicate but I love the hammered look! So pretty! I've got my eye on the initial rings! This is exciting! I love this shop! Such a great jewelry!! I do love the birthstone rings!! I rarely enter giveaways, but I just love this jewelry! What a great company! Great company with gorgeous products def a good reason to play favorites! Love that sterling ring, Aunie! Thanks for the giveaway. I love the wrap ring! So simple and perfect! I would be so happy if I won this giveaway! I love the his/hers rings and the heart wrap ring! My next gift to myself for pounds lost is jewelry this would be perfect! I love the Vintage Pearl! I have the most beautiful ornaments made every year as Christmas gifts! I love their jewelry. I would get a necklace. Love the jewelry! the rings are adorable! I've noticed these pieces before and LOVE them. PICK ME! PICK ME! I would love to have a personalized birthstone ring!!! YAY! Yours look great stacked! Omg! Those pieces are so pretty! I love them! I have a necklace from the Vintage Pearl and absolutely love it! Would like to add more pieces to my collection! Girl. I want that wrap ring like you have. It will go on my right hand. It will have my name, Bills name and my kids names. I will still purchase it even if I don't win! Her stuff is GORGEOUS! I bookmarked her site! So exciting! Wow, so much beautiful jewelry!! I love finding cute little places like this to get cute finds from :) AWESOME! I've been a big fan of your wrapped ring for a long time. The Vintage Pearl is lovely! I love The Vintage Pearl! They have so many cute pieces. All of these are so lovely, it is hard to say, which is my favourite! The birthstone rings are cute, and if course the baby feet necklace too. Beautiful jewelry. Love your stagged rings. I love the Vintage Pearl. Your stacked rings are amazing! I so hope to win. I have been envying them for awhile now! Ohhhhh, I love, love, love, LOVE The Vintage Pearl. As soon as we found out I was pregnant, Husband bought me a necklace with Baby K's name on it. I also bought necklaces for the grandmothers-to-be too! Huge fan of TVP, thanks for the giveaway opportunity!!!! I'm babysitting my niece at the moment. That's a something to mention, right? Love all of the jewelry, especially the rings!! I love the birthstone rings! I'd love the birthstone rings for my boys - it would make a really cool Christmas gift for my momma! Ok - I found the gotcha day necklace - DYING! What a neat gift for those who are or have adopted?! I'm an adopted kiddo myself, and I just think that "gotcha day" is the best! I put it on my FB and tagged your FB page, but I don't know how to add the link? I'm sorry! Please count it! I would love the leather cuff for my fiance. He loves those kinds of things! I love what you did with the birthstone rings, it's so sweet. I've been lusting over the the wrap ring for a while but I love your open heart ring too! I love, love, love those initial rings! So cute! Um this is adorable. I want to know how the photos went!! Call me biased, but I think my school photos were pretty darn cute... though I did have a few bad years! Shoot, Carlye I'll BUY you a special piece... you deserve it, lady! Oh that makes me so happy! It's unique... I've never seen another ring like it so I'm so glad you like it. What did you get written on yours? THANKS FOR SHARING ALEXANDREA! PS> I'm allergic to most kinds of jewelry too... it's so nice to find a company that does real metal! Oh no no no, I'm sorry to confuse you... I meant that I love right-hand rings so much, but not as much as my wedding ring. My wedding ring is from Jeff Cooper :) Sorry to mix it all up! So fun! Very glad you like their jewelry :) Good luck! THANKS FOR SHARING KRISTIN! GOOD LUCK! oHHHHHH... no! Not yet! I meant "ours" as in wedding date. Ha... oops! That's a perfect way to celebrate! Oh that's such a wonderful way to remember each year. What a beautiful tradition! Thanks for the giveaway! All the items on the Vintage Pearl site are GORGEOUS! I agree with you. I love having a go-to silver ring for my bare fingers. Good luck at your race. THANKS CHRISTY! Sunday's the day... can't believe it's here already! Lovin the initial rings for couples! 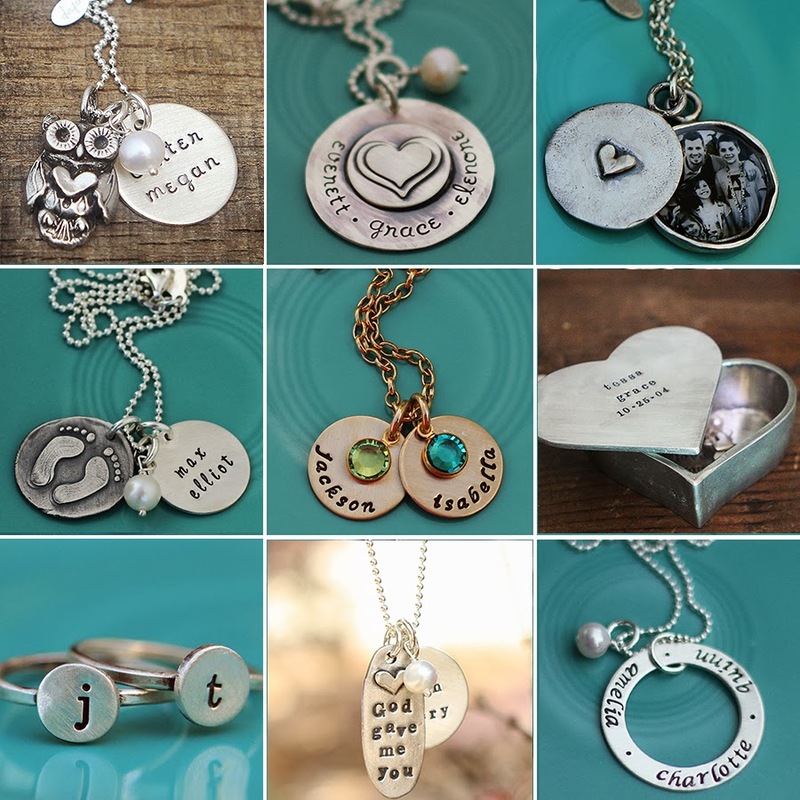 Love personalized jewelry! Definitely bookmarking some of these for Christmas gifts! I really love vintage style - and your blog is great :) have a good run tomorrow! I love the little owls and the his and hers rings! Thanks a bunch, Kitti! Best of luck! Update to add Rachael Ferris for comment 1. Update to add Rachael Ferris for sharing on Facebook.